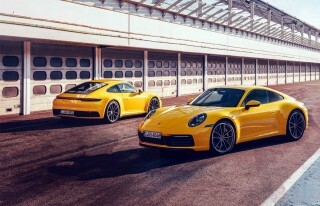 “The familiar 911 traits of adjustability thanks to its rear-mounted engine are clear” 992 first drive We get in the newest generation of 911 and pit the S and 4S against one another on track Drive-My is one of the first to get behind the wheel of the new 992 with a Carrera S vs 4S track test Written by Kyle Fortune. Photography by Richard Pardon. Once inside, this is clearly a 911 for a new era. The quality takes a leap, the build feeling substantial, the materials, too. It’s an attractive cabin, the centre dash coming with a near 11-inch screen containing all the info and entertainment functions. It’s a touchscreen, adding connectivity and configurability to your nav and entertainment that you probably never knew you wanted or, arguably, needed. Choose the Sport Chrono and you’ll be able to select the driving modes via the Mode switch on the steering wheel, that alone worth the option price. Underneath the PCM sit five toggle switches. The first two are programmable here (or being Wet or Sport modes if you’ve not optioned Sport Chrono) the remaining three being the hazards, PSM and, in this car, PDCC. There’s a dominant analogue rev counter ahead of you, as it should be, its redline at 7,400rpm. 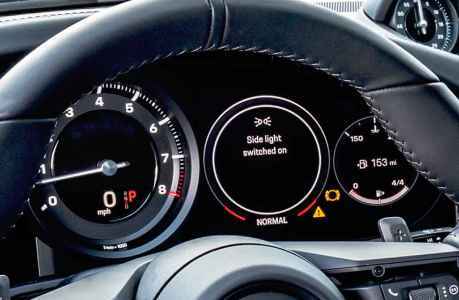 Either side of it are screens, configurable again, aping the layout of the 991, with either conventional-style dials or various choices of nav, entertainment or drive mode display. They’re bright and clear, if slightly obscured from view by the optional GT Sport version of the steering wheel. That option adds not just some sizeable contouring over the standard steering, but some fussy detailing. The standard steering wheel loses none of the functionality of the GT Sport one, looks neater, and affords a better view of those instruments. Attached to the wheel are the paddle-shifters, which is the only means of manually shifting the PDK. The small gear selector on the neat centre console only offers Park, Neutral and Drive, denying those drivers who like to use the PDK stick to go up and down the ‘box the opportunity to do so. It’s not an issue for me, but I know of a number of drivers who still like to do so, Andreas Preuninger being among them. 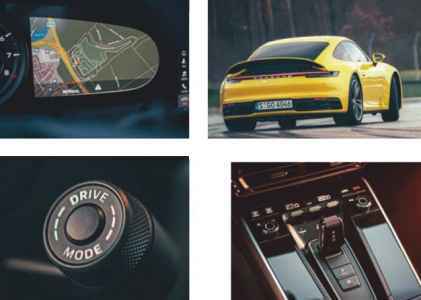 Keyless operation means there’s no need to take the key from your pocket, Porsche retaining the ignition on the opposite side to the shifter, it requiring a twist like a key, retaining some semblance of mechanical connection that’s infinitely preferable to a push-button. Doing so fires the same capacity 3.0-litre flat-six of its predecessor. It’s dubbed the 9A2 evo, having being significantly revised to improve economy. There’s a 200 bar Piezo injector system, new turbochargers, optimised fuelling, a new cast manifold, reduced internal friction, a higher compression ratio and reduced consumers scavenging power. The result of that is 450hp and 530Nm, the peak torque arriving a little bit later in the rev range than the 991’s. 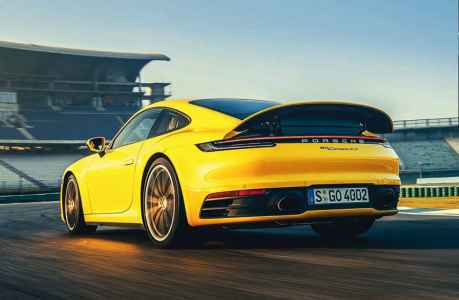 That’s a by-product of the fitment of a petrol exhaust fitment, something that US-specification cars do without for now, it having no other negative effect on the performance or indeed sound, according to Porsche. 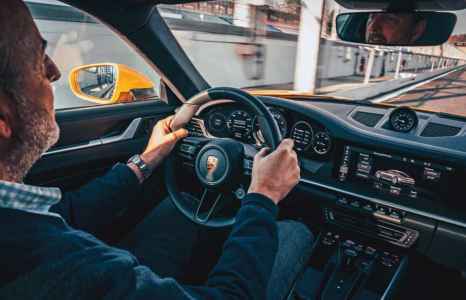 Having heard both back-to-back on the pre-drive in San Francisco, the particulate filter does impact on the engine’s sound, muting it a bit, making the Sports Exhaust a must-tick option if you want to hear the 911’s flat six sounding its best. In isolation it’s fine, but the knowledge that it could sound better still rankles a touch. Emissions necessity trumps aural pleasure, then, but there’s little else to complain about, the bulk of the work on the engine also having benefits to how it reacts. If there’s any lag it’s infinitesimal, the 9A2 evo unit building on the already strong performance of the 9A1 unit of the 991. 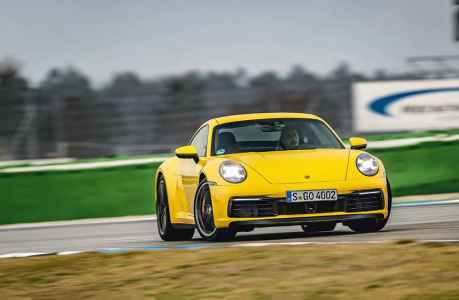 The ample low-rev torque delivers huge flexibility, yet with peak power arriving at 6,500rpm there’s incentive to rev it out, the reward being a linear shove that’s more super than sports car, the 911’s performance now such it’s moved on a league. In the Carrera S that means a 0-62mph time of 3.7 seconds, 0-100mph in 8.1 seconds and a 191mph top speed, that 0-62mph time dropping to 3.5 seconds if you opt for Sport Chrono and 0-100mph time to 7.8 seconds. Do the same in the 4S and the additional traction gains it 0.1 seconds for a 0-62mph time of 3.6 seconds or 3.4 seconds with Sport Plus in Launch Control. In both you’ll need sixth gear if you’re planning on reaching the maximum speed, seventh and eighth being geared for cruising economy. 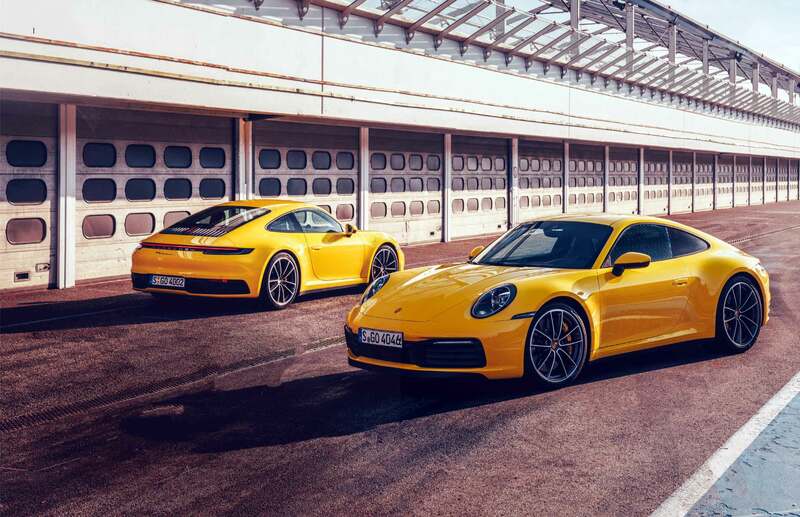 Seventh and eighth are redundant today then, with the Hockenheimring to drive it’s all about assessing the nuances between the Carrera S and its 4S alternative. The temptation to hammer around the track fully lit is sizeable, but a couple of sighting laps in both reveal that, badges aside, you genuinely would be hard pushed to tell there’s any drive being apportioned to the front axle in the 4S. Both cars are equipped with PCCB brakes for when the speed does inevitably rise around here, which given not just the speeds possible, but the increased weight of the 992, is no bad thing. ABOVE Twin oval exhaust pipes signify Sports exhaust, a must-have option if you wish to enjoy the aural delights of the turbo’d flat six. ABOVE AND LEFT 992 has clear styling cues from previous 911 generations, though the pop-out door handles are an unconvincing creep towards automation. 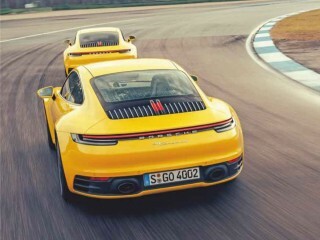 ABOVE Even on track, you’d be hard pressed to tell the difference between the rear-drive and all-wheel drive 992. ABOVE Kyle gets to grips with the 992, including its five new ‘shortcut’ toggle keys situated below the PCM. ABOVE It’s bigger and laden with more tech than ever, but crucially the 992 still drives like a proper Porsche 911. Secret GT3 owner - want to know the very latest on the Porsche 991 GT3 engine replacements? Martini racing livery for Porsche 911 S series 991.